ABORIGI-LOL is a pair of indigenous comedians, Dane Simpson and Matt Ford, touring Australia to remind the country that not all the brown guys you see are Indians. Dane tells a lot of dad jokes; not just bad puns (though there are those) but jokes about his dad. Dane was born in Walgett and his dad still lives there. There’s some clash-of-cultures storytelling here, not just because Dane grew up in the bush and his dad is wide-eyed and searching for coffee when he comes to Melbourne. Some of the best jokes are about when Dane goes back up bush to visit one or other of his parents. Matt has a much more assured air about him; his jokes dig a bit deeper into who he is and how he fits into his family and the country. He works in the arts, so his family laughs when they hear he’s been to Bunnings. And though he’s a comedian and happy to work in front of crowds, he’s definitely shy when at a party. He likes to turn up early because at least he knows the host and then tries to avoid being introduced to people, hoping they’ll think they’ve already been introduced to him earlier. And as far as meeting women is concerned, he’s got that covered – he’s bought himself a pug. Dane and Matt have been touring as part of Aboriginal Comedy Allstars all across Australia. 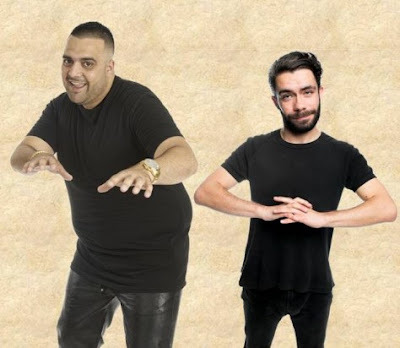 As part of ABORIGI-LOL they each do a set of around twenty-five minutes of personal observational comedy, taking apart how they see themselves and the country they live in: their strengths and its flaws. Dane and Matt are lol-ing at the Malthouse until April 23.